After multiple months of a stark, white landscape, we arrive in late March when this photo in Minneapolis was taken. Full of color, finally, this is the Minnesota that so many of us love. 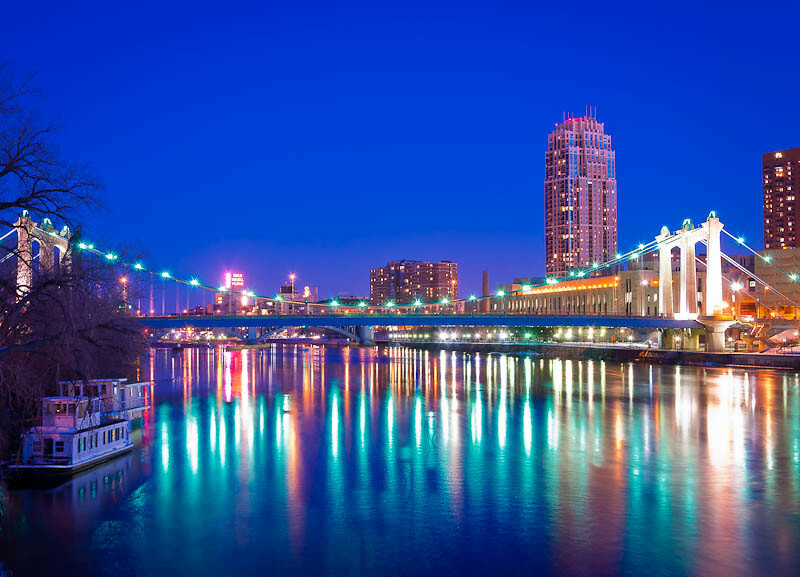 The photographer says: This image taken during twilight is from a railroad bridge that runs parallel to the Hennepin Avenue Bridge and provided this vantage point. Lucky for me a train didn’t pass through during my 20 minutes there! The colors in this shot really work well together. I especially like the tone of the blue sky and the teal lights reflecting from the bridge on the Mississippi River. Left of center is a Gold Metal Flour neon sign that add the yellow and red reflections in the water. Also note the two riverboats in the lower left, another nice detail that contributes to this scene.